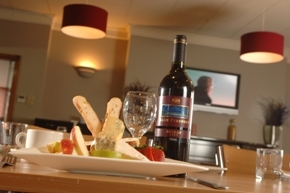 The Red Lion is a vibrant venue offering restaurant and cafe style meals. There is a contemporary, comfortable atmosphere, and the presence of big screen TV's mean that major sporting events are covered via Foxtel and free-to-air connection. The venue also boasts an enclosed playground. There are two distinct dining areas. The more formal Restaurant area offers full table service, and group bookings are welcome. The Cafe/Bar area allows for more informal dining. Corporate and special functions can be catered for, with conference and function rooms attached to the venue. Please phone to discuss your group's requirements. Gluten free dishes are marked on the menus, and there is a wide selection of dishes to choose from, including desserts. Many other meals can be adapted as well, since the chef is conversant with gluten free dietary requirements. Breakfast is available in the Cafe/Bar from 8am-5pm every day and most breakfasts can be made gluten free. The Sovereign Park Motor Inn is located right next door, allowing an 'eat'n'stay option - an added bonus for the ideal gluten free weekend escape!